Juventus' hunt for Champions League glory continues on Tuesday as they face off against Ajax in the second leg of their quarter-final clash. ​I Bianconeri have the upper hand in the tie after Cristiano Ronaldo bagged an away goal during the 1-1 draw at the Johan Cruijff ArenA last Wednesday, but the job is far from finished just yet. 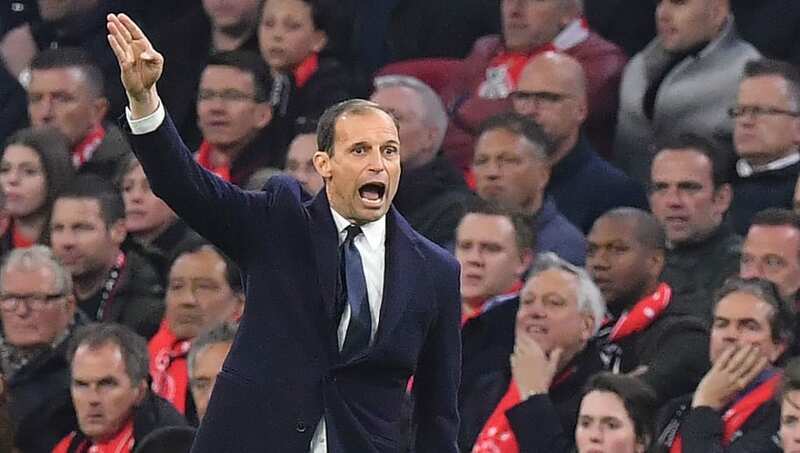 Massimiliano Allegri made wholesale changes for his side's Serie A defeat against SPAL at the weekend, but he's more than likely to revert back to a much more familiar looking side on Tuesday. Here's a look at how ​Juventus could line up. Wojciech Szczesny (GK) - Szczesny was rested on Saturday, but he is very much the number one keeper at Juventus and is yet to miss a single minute of Champions League action so far this season. Joao Cancelo (RB) - The Portuguese has firmly established himself as the first choice right back at Juventus and his overlapping runs on the right flank could prove to be crucial if his side opt to take an offensive approach. Leonardo Bonucci (CB) - Ajax had a clear game plan to swamp Bonucci whenever he was in possession in the first leg, so he'll have to be careful not to overdo things at the back. Daniele Rugani (CB) - Giorgio Chiellini's injury has given Rugani the chance to step into the limelight and he coped well during the first leg, which should give him the confidence to step up again on Tuesday. Alex Sando (LB) - Sandro's importance to Juventus cannot be underestimated and he is more than likely to be playing deep in Ajax's half to provide an extra dimension to the attack. Miralem Pjanic (CM) - Pjanic was a little off the pace in the first leg and he'll be in for another tough evening if Ajax's energetic midfield hit top gear once again. Rodrigo Bentancur (CM) - Bentancur has been in fine form recently and his place in the starting XI appears to be secure; so long as Allegri continues to field a 4-3-3 formation. Blaise Matuidi (CM) - The French midfielder left the field early with a calf injury in the first leg, but he has insisted that he should be fine to return to action on Tuesday evening. Federico Bernardeschi (RW) - Bernardeschi has nailed down the right-wing position after some stellar performances this season - particularly in the Champions League. He wasn't all that influential in the first leg, but Douglas Costa's injury will see him easily retain his spot in the starting XI. Cristiano Ronaldo (LW) - The man for the big occasion, ​Ronaldo was bought with the sole purpose of delivering the Champions League to Juventus. The Portuguese star has already scored four goals in the knockout stages of this year's competition and it would come as no surprise if he was able to add to that tally. Mario Mandzukic (ST) - Mandzukic certainly isn't prolific in front of goal, but his importance to Juventus cannot be underestimated. He tends to get the best out of those around him and that's not forgetting the impact he can have when defending set pieces.